Speaking and listening underpin everything we do, in every subject of the curriculum. From reciting rhymes and poems to debate and discussion and explaining how they solved a problem; oral language underpins every subject. Oracy enables children to express their thoughts, feelings, understanding and ideas fluently. It also helps them to clarify their thinking and to understand new concepts. Talk is essential to children’s thinking and learning and to their productive engagement in classroom life, especially in the early and primary years. Barnton Community Nursery and Primary School is a ‘Talk for Writing’ school. 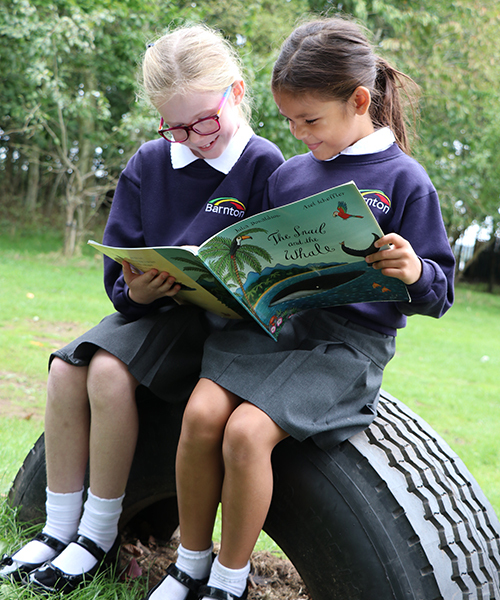 We believe that giving children the opportunity to imitate language and tell stories from Nursery through to Year 6 impacts, not only on their vocabulary, but also on their enjoyment and ability to write. Our curriculum emphasises the importance of integrating and embedding the development of speaking and listening across English and the wider curriculum. It also makes explicit links to the accurate use of grammar and the choice of appropriate vocabulary with the understanding and use of standard English. Spoken language underpins the development and progression in both reading and writing.